Etude House's & Rose Collection has just launched, and it is indeed a gorgeously girly collection. Etude House claims that the & Rose Collection is inspired by the fairy tale ‘Sleeping Beauty’, and is supposed to capture the magical moment when Princess Rose is blossoming out into a alluring lady from a pure little girl. So that explains the name of the & Rose collection. Etude House & Rose Collection: Pink and Pretty! Name aside, I've had a chance to try the & Rose Rosy Lip Tints and & Rose Flowering Nails from the collection. Both have really impressed me! Both have really impressed me, and I think they are worth getting! I'll start off with the & Rose Collection Rosy Lip Tint and then move on to the & Rose Flowering Nails sets. 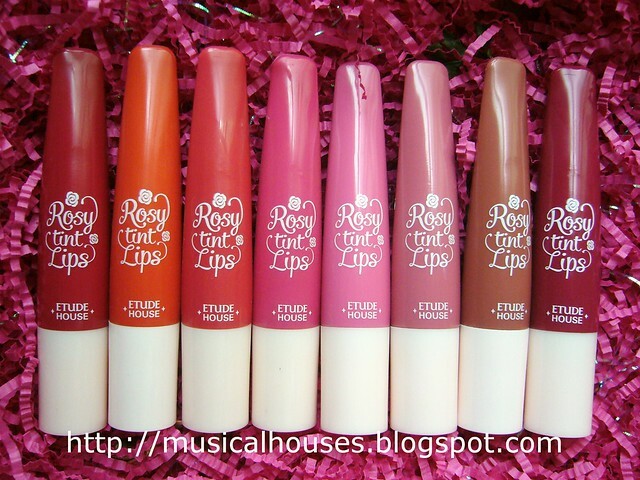 Etude House & Rose Collection Rosy Lip Tint: A range of 8 shades of pinks and roses. First let's take a look at the & Rose Rosy Lip Tint. These are packaged in a hard plastic tube with a sponge tip applicator. The sponge tipped applicator is to allow two kinds or application - a lighter touch using less pigment towards the outer edges of the lips, or a full-on high-coverage pigment all over. And these are actually indeed really pigmented! The Rosy Lip Tints have a creamy texture, and dry matte-ish on the skin, so they feel quite a lot like a lip cream. Although the hard plastic tube can be a little hard to squeeze initially, once you get the product out and onto your lips, you get a really lovely product. 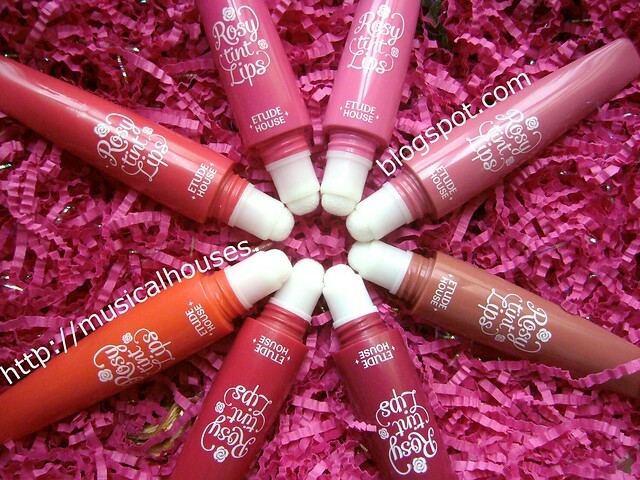 Etude House Rosy Lip Tint: A plastic squeeze tube filled with highly-pigmented creamy colour. The range of colours is fantastic, with eight shades covering a range of shades and undertones, from light pinks to deep rose shades. The two hero shades are #5 Baby Peony and #8 After Blossom, but I really had trouble picking a favourite. When I wore these, I found that the quality was much better than I expected, especially given the price! The creams have really great pigmentation (no kidding! ), a nice creamy texture, and because they dry matte, once they are dry on the lips, they really don't budge or smudge. They also have pretty good staying power - after swatching my arm and showering, I still had faint lip tint stains on my arm. That's why I love them so much. Great pigmentation, nice creamy texture, doesn't budge, what's not to love? And from the swatches you see below, you can tell they have all sorts of reds and pinks - from warm corals to cool magentas, you're pretty much covered. #1 Before Blossom is a straight up vibrant red with a healthy dose of pink thrown in. Think fire engine red, but with some sweet pink inside. #2 Sunny Flower is a orange-leaning pink-red. This is a very warm-toned shade, veering on the orange side. #3 Rose Petal is a coral shade, with some red thrown in. A very nice coral with a pop, wearable but bright. #4 Sweet Poison is a cool-toned magenta pink shade. It's kind of like hot pink, but more wearable. #5 Baby Peony is a pale pastel-like petal pink. Although it's pale, it's pigmented and not sheer at all! Great for anyone who wants a full-coverage pale pink. #6 English Garden is a mauve pink, very girly and pretty looking. It's also on the paler side of the spectrum but not as much as Baby Peony. #7 Tea Rose would be a great choice for those looking for a work-appropriate neutral. This is a neutral brown-pink with some warmth to it. A very pretty shade on most skintones. #8 After Blossom is a full-on, full-coverage blue-toned rose red. So pretty, and lovely. Definitely a great pick for night events! 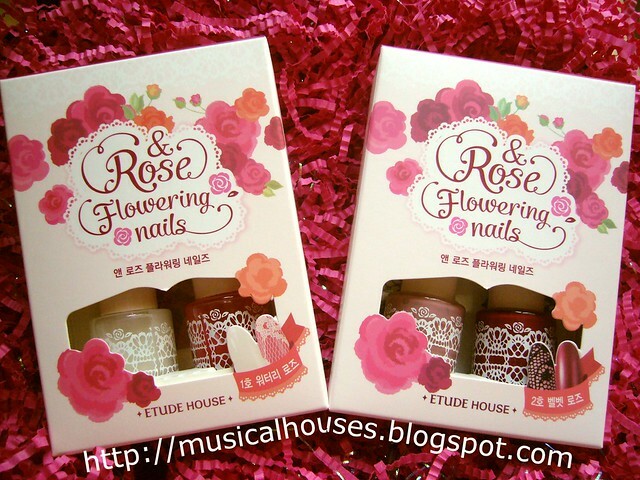 The next item is the & Rose Flowering Nails sets. There are two sets of colours, #01 Watery Rose and #02 Velvet Rose. Each set has two nail polishes with at least one pink, and a white or black lace design sticker. What I really like about the lace stickers are that these use actually cloth lace! It's not just a plastic sticker with a lace design printed on it. It's an actual piece of lace with a clear tape below to adhere it to your nail. I wonder if Etude House sells the lace stickers separately, because if they do, I need to stock up! 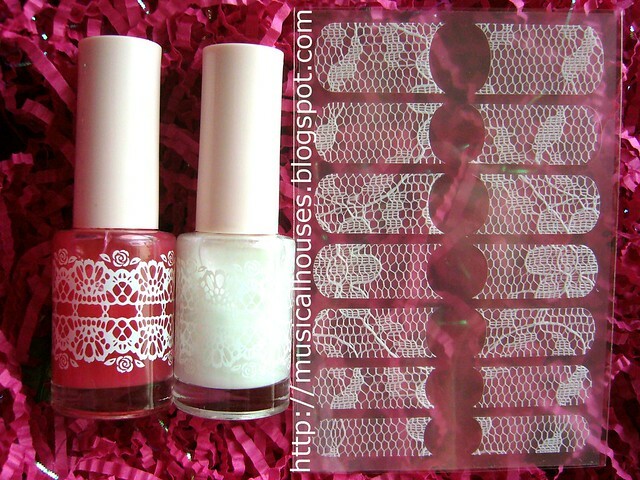 Etude House & Rose Flowering Nails sets: Lace designs with pink nail polish - what's not to love? Below you can see the contents of the first set, #01 Watery Rose. It has a pearly white polish with pink sheen, a light pink sheer polish, and a white lace design sticker. You're supposed to use the white and pink polishes to form a gradient effect, then stick the lace sticker on top. The effect from using this is a very girly, feminine effect. Etude House & Rose Flowering Nails #01 Watery Rose: White lace with a white and pink base. And below, #02 Velvet Rose. This is a more dark, dramatic nail look, with a pink or red base, layered with a black lace design. 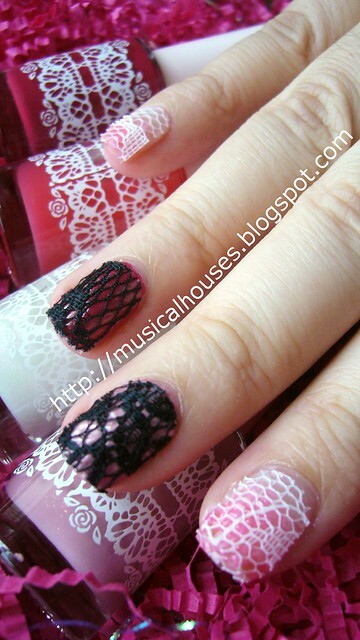 Etude House & Rose Flowering Nails #02 Velvet Rose: Black lace with a red and pink base. Below, you can see my attempt at using the sets. The index and last fingers have the #01 Watery Rose set featured (I don't know if you can see it, but I did an ombre with the pink and white polish, and then put the white lace on top), while the two fingers in the middle used #02 Velvet Rose, one with a pink base, and one with a red base. These were actually very easy to use, and I did one entire hand in probably a little over half an hour (with base coat, dry time, and sticking the stickers on top). Because the nail stickers are quite long (or maybe my nails are short), I found it easier to cut each sticker to the desired length, and then stick them on my nail and then trim whatever tiny bit of excess is sticking out, rather than sticking on the entire sticker and then trying to cut out a lot of excess. You might need a little bit of experimentation to find what method works best for you, but it's generally quite easy to use, and looks really good on. My verdict on the & Rose Collection - or at least, the Rosy Lip Tints and Flowering Nail Sets, is that both are really lovely, and worth getting. Sure the shades are on the girly side due to the rose theme (so if you're looking for blue lipgloss, I'm afraid this is not your collection), but the products are excellent, especially for the price. The Rosy Lip Tints have great pigmentation, texture and lasting power, while the Flowering Nail Sets really stand out with the lace designs. In fact, I half-suspect you could repackage the Rosy Lip Tints and re-brand them with a more expensive brand, and people would still pay for it. I have to say I'm impressed with the & Rose Collection items I've tried. I'll be putting up more looks with the nail sets and the Rosy Lip Tints as I go along, so you'll be seeing more of them on the blog! the black and white lace is so pretty ! The Rosy Lip Tints look amazing my dear. Particularly Sweet Poison and Baby Peony. The lace nails looks so cute too. 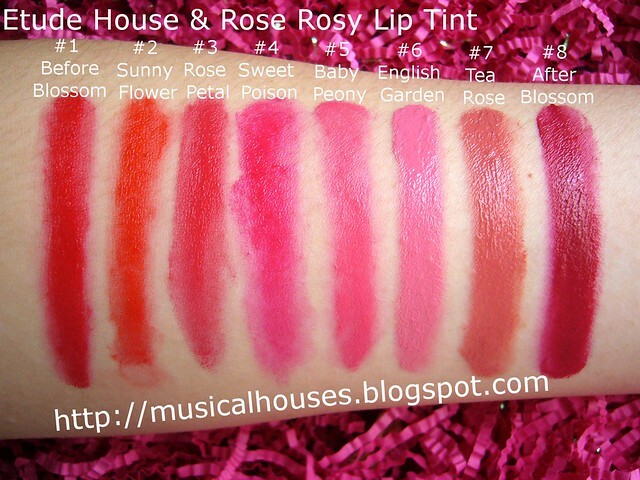 Love the tea rose lip tint! I super love the color for it is not too light and not too dark. This will def be in my purchase list. Great review, love those rosy lip tints! Thanks for the review!! The rosy tints are so amazing and pigmented! !